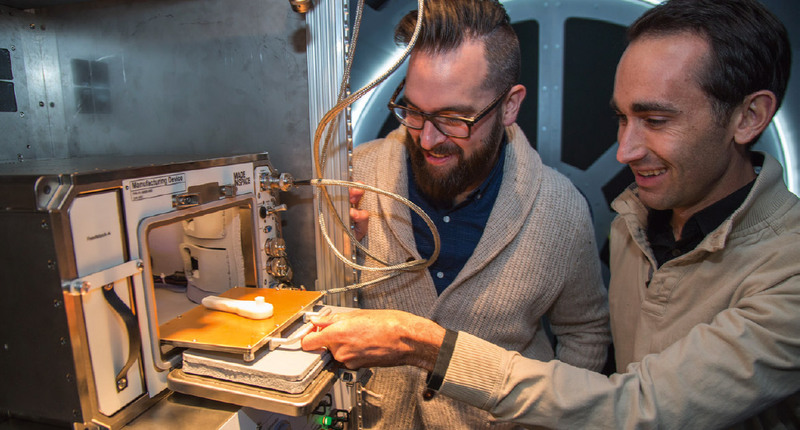 Until a year ago, commercially printing objects in space was the stuff of science fiction. Not anymore. 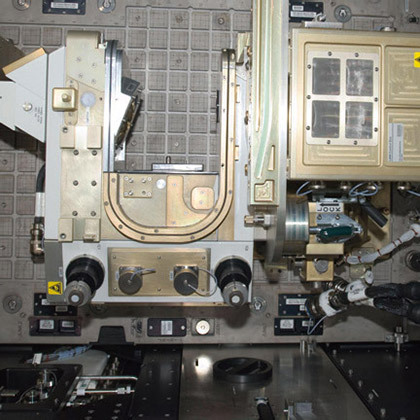 At any given time onboard the ISS National Lab, a 3D printer receives data files from Earth that it transforms, layer by layer, using plastics, into fully functional tools and parts that ISS crew members can use. This March marked one year since the Additive Manufacturing Facility (AMF) was launched as a permanent “machine shop” on the ISS, providing in-orbit fabrication services to customers from both the ISS National Lab and NASA. The AMF, owned and operated by California-based Made In Space, has come a long way from its origins as a proof-of-concept payload launched to the ISS in 2014. That initial prototype proved that 3D printing in microgravity actually works and that there was commercial demand for parts Made In Space. Today, the AMF continues to produce objects on-demand not only for NASA but also for a multitude of commercial companies, fueling the growth of a new economy in low Earth orbit. The Made in Space Additive Manufacturing Facility (AMF). Before the AMF, any spare parts for the ISS and materials or tools required for experiments on the ISS had to be transported from Earth on a launch vehicle and stowed away onboard until (or if) needed. With the AMF, an ISS crew member or user on the ground can custom design, print, and manufacture an object on demand on the ISS, with the ability to do multiple iterations. “We can deploy much faster,” said Andrew Rush, Made In Space president and CEO. As an example, Rush shared how quickly the team designed a ratchet for ISS Commander Barry Wilmore in 2014 using the prototype microgravity 3D printer. The ratchet was the first tool ever to be designed on the ground, emailed to space, and printed in orbit. “We went from idea to part on station in a week. That is an order of magnitude faster than the traditional way of sending things to space,” Rush said. The AMF builds upon that first prototype unit. The new commercial facility is larger, modular, and upgradable. From a capability standpoint, the AMF can both scan and verify the accuracy of the parts it prints with no user involvement. While the AMF currently uses three types of thermoplastic polymers, it will support other feedstock as demand and applications grow. The plastics available now include: acrylonitrile butadiene styrene (ABS), the same material used to make LEGO® blocks; a high-density polyethylene (HDPE), such as the type found in home food containers; and an aerospace-grade polymer (polyetherimide polycarbonate or PEI-PC). Longer term, Rush and others could see these raw materials eventually recycled from other parts or recovered in situ from the moon or other planets. How does 3D printing in space work? Like an Earth-based 3D printer, the AMF uses an additive manufacturing method to print objects in layers of plastics, metals, and other feedstock materials. 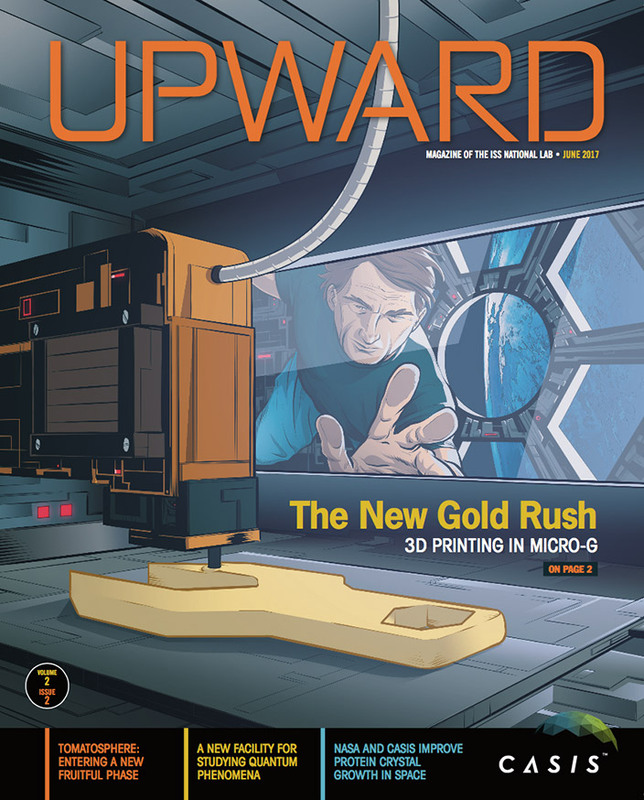 Made In Space relies on a 3D additive manufacturing technology called fused deposition modeling. Heating up the filament to a molten state, the material is precisely deposited through a trigger head in a back-and-forth pattern—layer by layer—until the part takes form. Moreover, the free-fall weightless environment of space results in the absence of convection, “so you need to make sure the hot parts stay hot and the cold parts stay cold without the benefit of natural convection,” Rush said. Made In Space has come a long way from the early days of proving its design. Initially the founders hoped to “buy a commercial off-the-shelf printer and tweak it until it could turn upside down and function as a space-capable printer,” said Rush. The team spent many sleepless nights testing and retesting their design. They fine-tuned the printer during two weeks of parabolic flight testing, which was critical to proving the design. The final system, designed to operate from the ground with no ISS crew member involvement, met NASA’s requirements for reliability, safety, and self-sustaining performance. 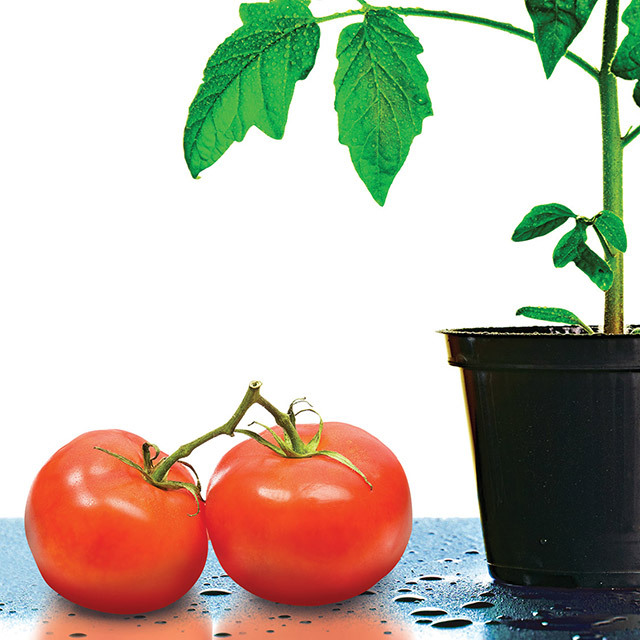 The AMF can use a wide variety of materials as feedstock because it regulates temperature and humidity. 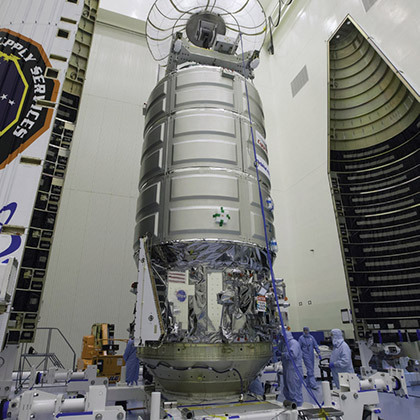 Its own environmental control system also keeps the materials within appropriate levels of containment, a required safety regulation for ISS hardware and facilities. Interestingly, this containment feature has been incorporated into 3D printers on the ground. Made In Space engineers on Earth control the AMF’s queue of print jobs, while internal cameras allow the company to monitor the printer’s operation and notify NASA when an object is printed and ready for retrieval by an ISS crew member. Since the AMF began full operations this past summer, it has printed more than a dozen objects, including a spaceoptimized wrench designed by Lowe’s Home Improvement Stores for the ISS crew members to clip on their belts to more easily perform repairs. Made In Space has designed numerous other ISS tools, including a sensor adapter, hose adapters, and spacecraft parts. 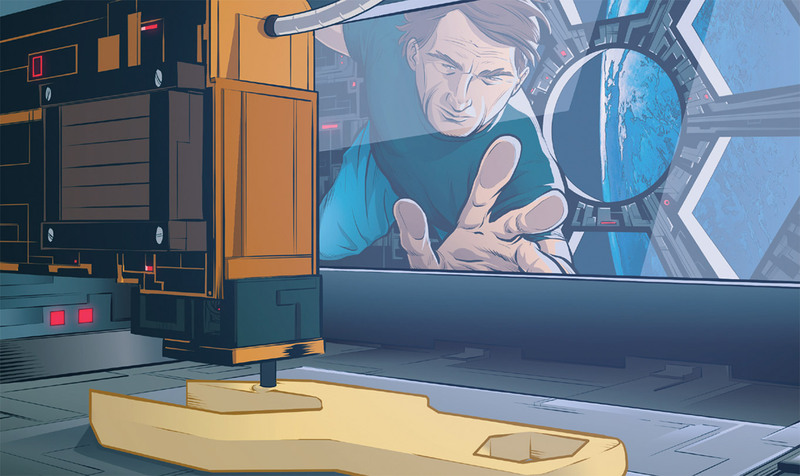 Made In Space already has a six-month backlog of print orders. Besides NASA, AMF customers include private companies, private individuals, universities, K-12 schools, and other government agencies. (L to R) Kyle Nel, Executive Director of Lowe's Innovation Labs, and Jason Dunn, Chief Technology Officer of Made In Space, use a 3D printer on the ground. 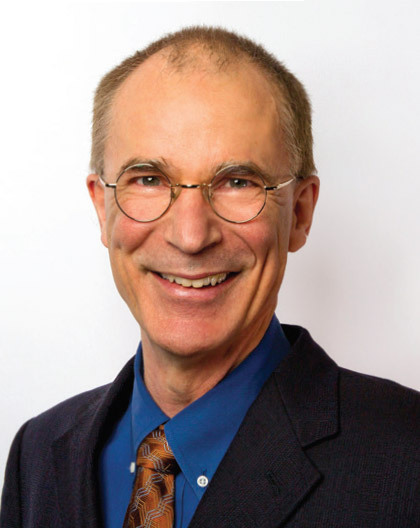 Given the types of novel ideas already being generated, tested, and printed on the AMF with partners like Lowe’s, CASIS’s Shields believes the future is bright for the AMF on the ISS and that it will grow to become a critical component of building a sustainable commercial presence in low Earth orbit (LEO). According to Shields, hundreds of millions of dollars have been invested to date by commercial players testing the waters for building a business in low Earth orbit, often using the ISS National Lab as their test bed. In the last year alone, approximately $75 million has been invested in LEO projects and activities. Made In Space is one of five companies now managing in-orbit commercial facilities on the ISS, a service provided by only a couple of companies just five years ago. By 2018, at least nine companies will be managing commercial facilities on the ISS, which together will total $100 million in commercial investments in the LEO space sector. The AMF is a critical part of that future, said Shields. Medical, aerospace, and materials companies are showing the strongest interest in the AMF, Rush said. The medical industry wants to make human spaceflight safer by equipping physicians to print out surgical instruments and perform needed operations when human habitation on the moon or on other planets is realized. In January, 3D4MD, a Toronto-based 3D printable medical solution provider, became the first company to use a 3D printer on the ISS to create medical supplies in space. The AMF printed a custom mallet finger splint using a laser hand scan saved from the fitting process for spacesuit gloves. 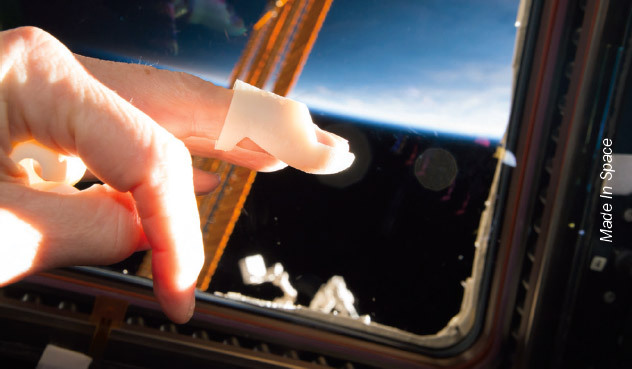 The splint has immediate application, given how common hand injuries are for astronauts. Aerospace companies are studying the design of space-optimized satellites that could be built and launched in orbit. They are also looking into how to make more digital tools for use on the ground and in space. In the materials arena, Braskem, the largest thermoplastic resin producer in the Americas, is working with Made In Space to fabricate tools and spare parts in space using biobased resin from sugarcane. Thermoplastic resins are raw, unshaped polymers that turn to liquid when heated and turn solid when cooled. The material can be continually remelted and remolded, allowing parts and scraps to be reprocessed. Thermoplastic resins tend to be recyclable, which adds to their value as a space material. 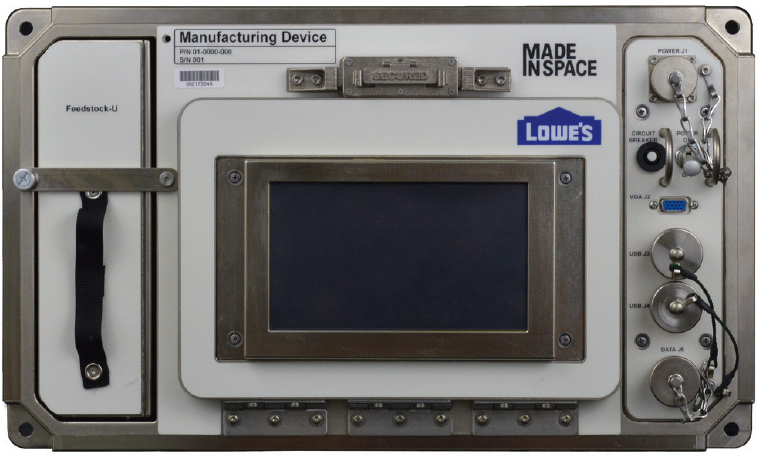 On the surface, one of the more unconventional partners working with Made In Space is Lowe’s, the home improvement company. Look deeper though, and you realize that Lowe’s Innovation Labs uses technology, design, and the power of story to help customers and employees innovate and build the future. Lowe’s Innovation Labs is developing on-demand manufacturing technologies that will shape our future. Kyle Nel, the Labs’ founder and executive director, regularly works with professional science-fiction writers to use short stories to jumpstart the creativity of Lowe’s leaders by helping them to better envision the future of hardware retailing. “We are pursuing a narrative for how technologies, including additive manufacturing, make it possible to get exactly what you need, right when you need it,” Nel said. Many of these futuristic concepts have found their way into Lowe’s stores to enhance the shopping experience of customers. They include everything from in-store robots to holograph-based virtual reality and 3D printing. Innovation Labs introduced an experimental 3D printer in one store to allow customers to “print” everyday hardware items. The strong response proved to Nel that Lowe’s needed a technology partner to take the 3D printing concept further. Made In Space fit the bill. Lowe’s has helped design everything from 3D-printed ratchets to specialized wrenches for the ISS, as well as other products Nel could not discuss publicly. Nel believes that tools rugged enough to withstand the harsh environment of space and the demands of space operations would more than meet the future needs of a Lowe’s customer on Earth. Nel and Made In Space visionaries also have devised a solution to a common byproduct of 3D printing: plastic waste. Their innovative prototype of a Plastic Recycler, while not yet deployed on the ISS, has the potential to efficiently turn plastic waste into filament that can be used to print new parts. The Multipurpose Precision Maintenance Tool, pictured above, was the winning design of the 2014 Future Engineers Space Tool design competition, which gave students the opportunity to design a tool for ISS crew members to be 3D-printed on the AMF. The design was submitted by Alabama high school student Robert Hillan. The AMF can currently print solid objects up to 10 cm x 10 cm x 14 cm, which is slightly larger than a softball. To make larger objects, the AMF can print connection features into parts and have the larger object assembled in space. Made In Space officials say future AMF-printed objects will be significantly larger— the AMF will be able to print objects a foot or more in length on one side. What's Next for Made in Space? Currently, Made In Space is working with NASA to build larger structures that can only exist in microgravity, said Rush. 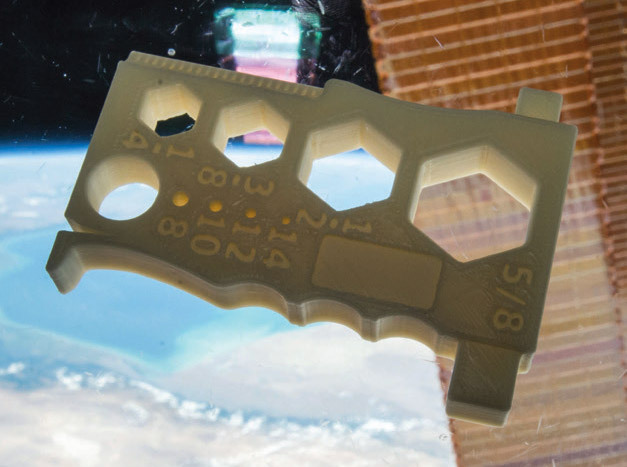 With in-space additive manufacturing, NASA could print, build, validate, and iterate antennas, trusses, or beams—the building blocks of satellites and future space stations. New satellites printed from space could revolutionize satellite design. One reason is they would be significantly lighter because they no longer would have to support their weight on the ground as satellites made on Earth do. 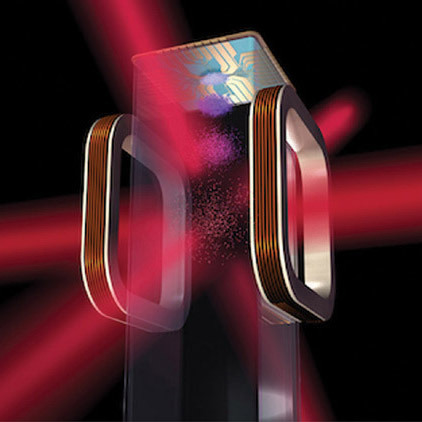 “We view the AMF as the foundation of a much broader suite of space manufacturing techniques and capabilities,” Rush said, “in particular, materials that can only be manufactured and processed in space.” He cited a payload Made In Space is building that CASIS will deploy on the ISS National Lab later this year to produce test quantities of ZBLAN optical fiber, building upon the technology operating in the AMF. Scanning electron microscope images of ZBLAN fibers: at left, processed in unit gravity forming visible crystals; at right, processed wIth magnetic eliminating crystal formation. 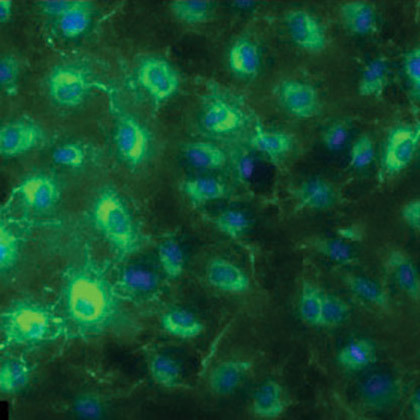 Rush predicted that ZBLAN could potentially replace silica fiber in long-haul telecommunications on Earth by making those communications faster and more reliable. “It has 10 to 100 times lower signal loss than silica fiber, and has a much wider transmission window, which means you can get better bandwidth and get better response time,” Rush said. NASA also recently selected Made In Space and its partners to develop a technology platform—the Archinaut—that enables the autonomous manufacture and assembly of spacecraft systems in orbit. Working with Northrop Grumman and Oceaneering Space Systems, Made In Space is designing and building a 3D printer equipped with a robotic arm to operate in low Earth orbit and manufacture space-optimized reflectors and booms, providing next-generation capabilities for government and commercial missions.